I’ve signed up for the Blogging from A to Z April challenge. Every day except Sundays (well, except for today) I write a blog post, going through the letters of the alphabet. Today’s topic: absurdity, by way of ants. 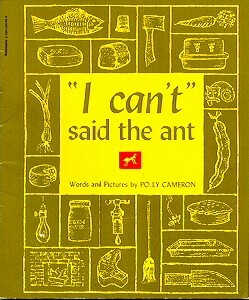 Particularly the ant in the book “I can’t,” said the ant, by Polly Cameron. My mom was the youngest of seven kids, the oldest being nineteen years older than her, so she ended up with a lot of books, meaning I ended up with a lot of old books. I loved to read as a kid and quickly devoured everything I checked out from the library. When I didn’t have anything new to read, I reread all the stuff we had in the house – mostly several boxes of the books my aunts and uncles had passed to my mom. And one of those books was this gem from 1956. For those of you not familiar with the story, Miss Teapot has fallen and broken her spout. Who will help put her back on the shelf? “I can’t,” said the ant. “You can,” said the pan. “You must,” said the crust. “Please try,” said the pie. It’s such a fun story, full of silly rhymes of dialogue and random kitchen objects. I think this is a great stepping stone book – kids need exposure to silly-yet-serious stuff like this, if they’re to appreciate absurd texts like Gogol’s The Nose or Dead Souls (okay, anything by Gogol), Catch-22, Monty Python…. And what’s a world without Monty Python? Have you ever read this book? Any books you recommend for developing an appreciation of the absurd in young readers? My daughter and I learned to love the Pigeon books (Don’t let the Pigeon stay up too late, Don’t let the Pigeon drive the bus). Yes, they are silly but we LOVED the feistiness of the Pigeon and how she interacted with everything and everyone around her. I love the Pigeon books too! I think you picked just the right word to describe the bird – feisty.